The first time I introduced myself to Steve Sabol and told him my name, he responded, “Heidi — Like the Heidi Bowl!” That’s when I learned that when your name is Heidi and you work in football, it makes people think of one thing: the infamous Heidi Game. 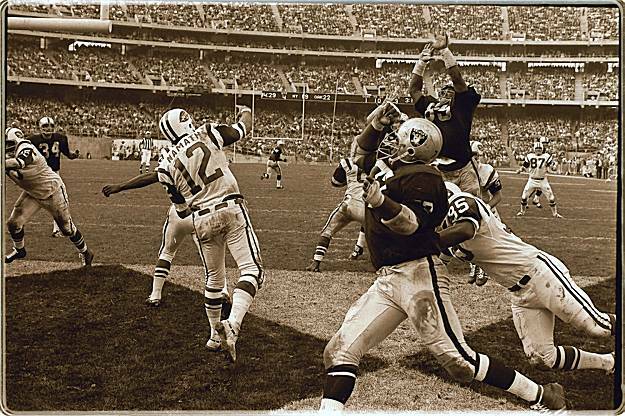 On November 17, 1968, the Raiders scored two touchdowns in the last minute of a tense, penalty-ridden game to overturn a 32-29 Jets lead and win 43-32. But nobody watching the game at home on TV saw the exciting conclusion, because at 7:00 pm Eastern, right on schedule, NBC switched to a made-for-TV movie of the classic children’s story “Heidi,” directed by Delbert Mann. 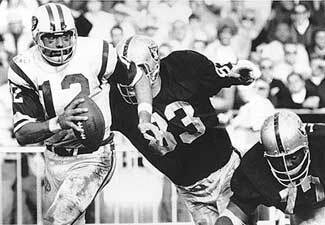 At the time, no professional football game on NBC had ever run over its allotted three-hour time slot. And in an era before DVDs and DVRs made movies available on demand, TV movies like “Heidi” were a major family event. NBC had heavily promoted it, selling significant advertising time to sponsor Timex, and was under tremendous pressure to air it on time and in its entirety. As the 7:00 pm deadline to air “Heidi” approached, fans demanding that NBC stick with the on-going game and families demanding that the network switch to the movie bombarded the NBC switchboard. So many angry viewers called in, they jammed the phone lines, preventing NBC executives from getting through to the control room to make an informed decision about what to air. So NBC programmers stuck to the plan and cut to Heidi right on schedule. The decision, of course, led to the debacle now known as the Heidi Bowl, my namesake game. It also resulted in two major changes to the way professional football games are broadcast on TV. First, it led to the creation of the “Heidi Phone,” a dedicated hotline on which network executives can always get through to their control room. But more importantly, the NFL amended its television contracts to require that games be broadcast in their entirety in the contesting teams’ home markets. Fortunately, Delbert Mann has gone down in history not as the director of the ill-fated film “Heidi,” but rather for his work on such classics as That Touch of Mink (1962), and Marty (1955), for which he won a Best Director Oscar. To this day, if you call the Heidi Phone, you will not reach me, but rather the broadcast control room as intended. And though my name is synonymous with one of the more ignominious moments in NFL broadcast history, it at least made for a memorable moment with Steve Sabol.